Each year, Southern Illinois University Edwardsville recognizes one faculty member who demonstrates the humanitarian qualities and philosophy of nonviolent social change such as those enunciated and demonstrated by Dr. Martin Luther King Jr. 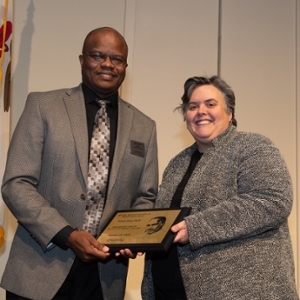 In honor of his scholarship and service, Myron W. Jones, PhD, assistant professor in the College of Arts and Sciences’ Department of Chemistry, received the Faculty Humanitarian Award at SIUE’s annual Dr. Martin Luther King Celebration on Wednesday, Jan. 23 in the Morris University Center Meridian Ballroom. A champion for minorities pursuing an education in science, technology, engineering and mathematics (STEM) related fields, Jones serves others by helping them achieve their goals and supporting diversity. “Dr. King worked tirelessly for the freedom and rights for all people,” Jones said. “His life was a model for those who value the virtues of equity, empathy, compassion, humility and justice. Jones serves as project director for the SIUE Louis Stokes Alliance for Minority Participation (LSAMP) program. A National Science Foundation-funded activity through Chicago State University, this program provides tutoring support and research stipends to minority students in STEM research. Jones also uses the funds to support student travel to the annual LSAMP Symposium in the Chicago area, as well as other conferences, enabling up to 15 student presentations annually by minority students that are actively involved in STEM fields at SIUE. Jones has worked alongside Eric Voss, PhD, distinguished research professor of chemistry, on science teacher professional development projects funded by the Illinois Board of Higher Education. The colleagues developed a network of more than 200 area teachers and engage them in learning higher-level skills in chemistry, physics and biology. These teachers return to their classrooms, armed with materials funded by the project. In their award nomination letters, Jones’ colleagues commended him for extending his service far beyond the service load of an assistant professor. He has played a key role in the College of Arts and Sciences (CAS) as a member of several committees, including the Black Studies Advisory Committee, the Honors Director Search Committee, and on the Ad Hoc CAS Budget Committee. In addition, Jones frequently attends extracurriculars that positively impact SIUE, CAS, and the community, including Meridian Scholar’s Day, Preview SIUE, the regional Science and Engineering Research Challenge (as a judge), and the annual Boy Scouts Chemistry Merit Badge Day. He has served for several years as the Chemistry Club advisor, a service assignment known for its expansive time commitment. “For those outside of chemistry, being this club advisor might be considered light duty,” said Michael Shaw, PhD, distinguished research professor of chemistry.” However, it means near-daily interaction with students for events at close intervals throughout the year. Jones also lives SIUE’s teacher-scholar model by involving undergraduate students in his research. Thirteen of those students have been involved in the University’s unique Undergraduate Research and Creative Activities program. Six students in the research group have been African Americans involved in LSAMP and have gone on to present at the regional meeting in Chicago. In addition to his professional duties, scholarship and servitude, Jones still finds time to work on his own academic research. He has developed a research lab geared toward the study of iron dinitrosyl complexes. Photo: Myron Jones, PhD, assistant professor of chemistry, and Denise Cobb, PhD, provost and vice chancellor for academic affairs, at the Dr. Martin Luther King Celebration Luncheon.